Today is National Apple Day - an annual celebration of apples and orchards, traditionally held on 21 October, although there are usually apple festivals taking place on the weekends either side. 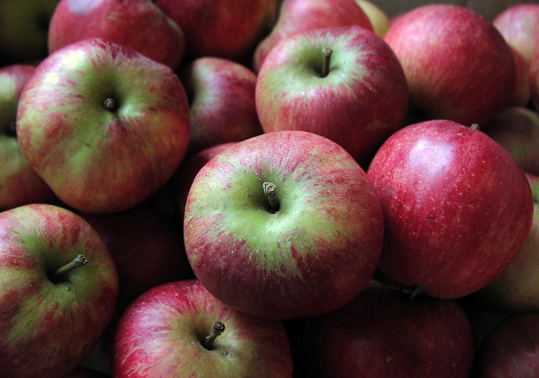 This year, I have had a superb harvest of apples from the tree in my own garden with lots of good-sized fruit. In fact, I've had rather too many even though I gave loads away to people and put a box of them outside my gate saying, "Free, help yourself". Although it has generally been a good year for apples, I'd like to think my tree's bounty was because I held a traditional Wassail party back in January, where we sang to the tree, offered libations of mulled cider and let off party poppers. Well, I say it was traditional, although in days gone by farmers would fire their shotguns to wassail the tree. Living in London where shotguns are these days largely only owned by criminals, party poppers had to suffice. Although my apples are eaters rather than cookers, I get a bit bored with eating them raw and they can be cooked even if they don't quickly go mushy. As well as baking pies and crumbles, I've been having apple and cinnamon porridge for breakfast. I cut an apples up into very small pieces and add a little cinnamon to the porridge before I cook it, then sweeten it with honey to taste. I've also been making carrot and apple soup. I know that might sound odd, but it is very nice. I've found you need about one large apple or a couple of small ones per five carrots and a small onion. Peel and core the apples, then chop up with the other veg and put in a pot with enough vegetable stock cover it all and a teaspoon of mild curry powder to taste. Boil the soup until well cooked, adding more water or stock if necessary, then put it in a blender or mash it up well with a potato masher if you don't have a blender. That makes a large bowl of soup for one hungry person or you could share it for two small bowls. Increase the quantity of ingredients if you are cooking for more people. Apples are very magical fruit. According to Rachel Patterson's book A Kitchen Witch's World of Magical Food, they are symbolic of abundance and excellent to use in spells to contact spirits, fairies or ancestors. Rachel says the apple magical properties are love, healing, clarity, knowledge, abundance and spirit work. They are ruled by the planet Venus and the goddess of love. So my soup would be perfect for sharing with someone you want to get romantic with or to cook up for a Samhain or Halloween feast. The photo shows some of the apples from my garden this year.